A lot of people ask me about labels, so I thought I would put together a little tutorial on them. There are plenty of places on etsy where you can buy labels in an array of prices, sizes and materials. But these are pretty cheap, hold up fairly well in the wash and are super easy. My computer crashed a few months ago and with Andrew studying for the CFA this Saturday and me liking sewing more than dealing with technical problems, I've been using his MacBook until he gets a chance to look at it. But, I'm about out of labels and unfortunately did not save the ones I used to use with a little crown. So I thought I'd let you in on the process. First, I take a photo or use a picture of the image and edit it in Picasa to add text, mainly because I can't figure out how to add text to photos in iPhoto. (see this is so easy you can be getting your online shopping done in the background). Add screen shot to the list of things I can't do on the MacBook. Once you have your image, you just play around with it in excel until you have a full page of the label size you want. Now all you have to do is print them in MIRROR IMAGE onto Ink Jet Iron On (or t-shirt) Transfer Paper. Add printing in MIRROR IMAGE as another thing I can't figure out on the Mac, so we will now resume the tutorial with the few bits of tags left from my old logos. 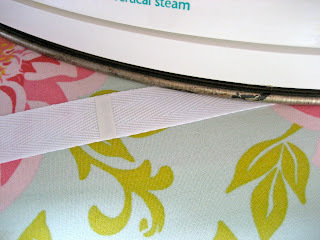 Once you are set with your printout you can cut out the tags and iron them on to whatever you want. For the square tags with the lion I plan to iron them on to white muslin and zigzag stitch them on to my products. For the sizes and smaller logo tags, I like to use twill tape. You just lay the print side down, iron for a few seconds, let it cool and peel off the paper (do not go over it with an iron after the paper is removed or you will have a big mess). If the paper doesn't peel off easily, let it cool more or iron some more and then let cool completely. I use the sizes vertically and tuck the raw ends of the loop into a seam. For the long logo tags I sew the twill tape onto the piece at either end, tucking the raw ends under. Just remember to leave enough plain twill tape on either side of your design to accommodate how you will attach it. Have fun labeling all your hand made items! Command-Shift-4, then drag and drop mouse over selected area: Screenshot of selected area as file on desktop. Command-Shift-4, then space, then click a window: Screenshot of selected window placed as file on desktop.